The orangutan pictured is just one of hundreds living at the Nyaru Menteng Orangutan Rehabilitation Center, which is operated by the Borneo Orangutan Survival Foundation in Borneo (Indonesia) and managed by Lone Droscher Nielsen. Kaja is a small island in the middle of the Rongan River where several dozen orangutans are living until they can be released back into a safe section of the rainforest. The problem is that due to the unchecked spreading of palm oil plantations, the forest is being cut down and orangutans are being slaughtered. This orangutan, like the 650 others at Nyaru Menteng, is an orphan. He watched as his mother was murdered and his forest home was destroyed. You can see him and the others on the series Orangutan Island on Animal Planet. Because of deforestation by the palm oil industry, orangutans are predicted to be extinct in the wild in less than 10 years. To learn more about orangutans and how to help them, please visit the Orangutan Outreach website at redapes.org. Haha, Pi, you and I the same! Tau pegi beli saje! 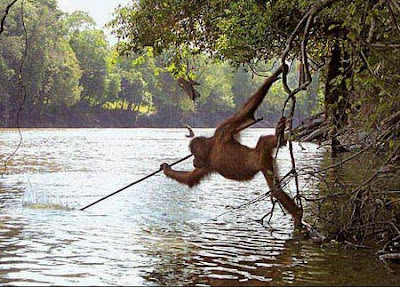 Buat apa susah susah pegi pancing? Hehe! Amazing how intelligent the orang utan is! Wonder if he ever had any success, eh?